Submarines, bombers and and a mobile launcher. Four ballistic missiles, two in each direction, crossed the Arctic hemisphere on 26 October. A salvo of two missiles was launched from a Pacific Fleet submarine in the Sea of Okhotsk towards the Chizha test range on the Kanin Peninsula in Arkhangelsk. A Northern Fleet submarine launched another ballistic missile from the Barents Sea that hit the target at the Kura test range on the Kamchatka Peninsula in the Far East. 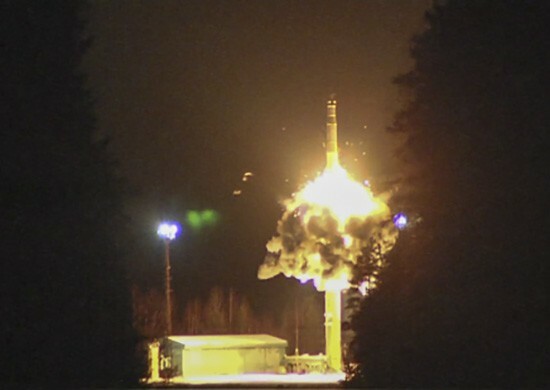 From Plesetsk in Arkhangelsk region, a Topol ballistic missile was launched, also crossing the Arctic skies before the dummy warhead hit the target at Kura test range. In total, four ballistic missiles were tested in what turned out to be one of the most massive nuclear missile drills in post-Soviet history. Russia’s Defense Ministry informs that all tasks in the exercise were completed successfully. The cross-Arctic ballistic missile drill was expected. Last week, the Barents Observer reported that larger areas of the Barents Sea were to be closed off for civilian shipping for the period October 20 to 30th. Long-range Tu-160 and Tu-95 strategic bombers, as well as Tu-22M bombers took off from their bases in Engels, Ukrainka and Shaikovka. The aircrafts reportedly launched cruise missiles towards targets in the Komi Republic, on Kamchatka and towards a test range in Kazakhstan. In the north, cruise missiles launched from bombers are normally targeting the Pemboy range near Vorkuta in the Komi Republic. On Wednesday, the multi-purpose submarine “Voronezh” of the Oscar-II class played war games in the Barents Sea and launched a Granit cruise missile near Novaya Zemlya, another report from the Defense Ministry informs. Also in September, during the exercise Zapad 2017, submarines from Russia’s Northern Fleet launched cruise missiles from the Barents Sea, as reported by the Barents Observer. The Defense Minsitry has released a video of the exercise, showing the launch from Plesetsk, strategic bombers taking off from airfields and the salvo of submarine launched ballistic missiles.